All Is Not Forgotten is terrible and gripping at the same time. Wendy Walker writes with an openness and honesty that sometimes made me feel sick, but which also kept me glued to my seat. Her story is raw and unpredictable. Every chapter delivers new clues and the direction of the story is surprising. The ending is something I could never have imagined and I loved that. She makes choices I didn't expect and keeps this up until the end of the story. The uncertainty that comes with it is magnificent and I was amazed on numerous occasions. 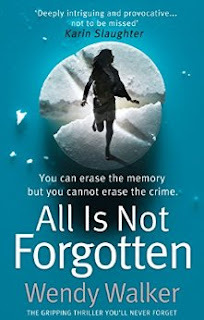 The narrator of All Is Not Forgotten is meticulous in his descriptions. The story is being told without much emotion, which is something that fascinated me. I wanted to know why and I also wanted to know why the narrator was telling something that at first seems so random, even if it's horrible. I was immediately curious. Jenny's attack is brutal and the book starts with the awfulness of it. It's a strong way to begin and fortunately Wendy Walker keeps up this level of quality, which makes her story exceptional. I can appreciate the brilliance and uniqueness of this story, but it doesn't sound like one that I want to read. This is exactly the sort of book I enjoy: raw, hard-hitting and honest.